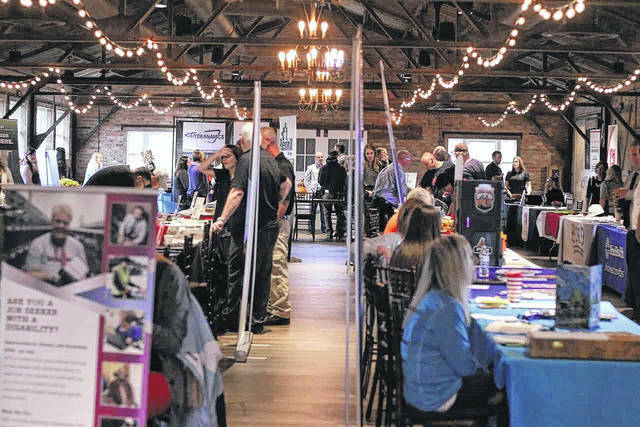 BUCYRUS — More than forty businesses were represented at The Crawford Partnership Job Fair held at Pickwick Place in Bucyrus on Thursday. All of them were looking for candidates to fill available positions from a wide variety of employers represented. Scott is the Business Finance Manager for J&F Construction in Bucyrus. She said that they usually participate in two job fairs per year, and she generally leaves with five applications that she will give further consideration. J&F Construction is a family-owned business with 28 employees. According to Scott, they only make the decision to hire someone when they know they are able to keep them on staff full-time. With their smaller business size, they are able to better manage their work load which helps them avoid layoffs. Employers at the Job Fair saw a steady flow of potential employees from all backgrounds and interests. “This is about the employees and workforce in our area,’ Hannah Jacobs, from The Crawford County Partnership. said. Thursday’s job Fair was the first one for Jacobs with the Partnership. Put simply, The Crawford Partnership is working to move in the lives of residents of Crawford county. They are focused on bringing new business to the area, as well as develop the resources to help make the local workforce the best it can be. The Partnership works in conjunction with the Chamber of Commerce and the newly established Crawford Works program. All three programs are now housed together at 117 E Mansfield St in Bucyrus and invited the public to an Open House following the Job Fair. Crawford Works had a significant presence at the Job Fair. A non-profit organization, Crawford Works is modeled after a Cincinnati Works program in southern Ohio. Their primary philosophy is captured in one phrase “A hand up, not a hand out.” Through donations, they are working to train, educate, and prepare interested, dedicated, and willing individuals to enter the workforce with coordinating employers in the area. Crawford Works has a simple intake criteria: a willingness and ability to work, drug free lifestyle, and stable housing. Once those areas have been evaluated, members are required to participate in a Job Readiness Workshop that addresses skills, conflict resolution, money management, and professionalism. From there, Crawford Works staff will coordinate with their Employer Partners to find a suitable position for the job seeker. Erin Miller | Galion Inquirer A job fair sponsored by The Crawford Partnership was held Thursday at Pickwick Place in Bucyrus. More than 40 employers were on site looking for to fill positions in the Crawford County area. https://www.galioninquirer.com/wp-content/uploads/sites/38/2017/10/web1_Job-fair-again.jpgErin Miller | Galion Inquirer A job fair sponsored by The Crawford Partnership was held Thursday at Pickwick Place in Bucyrus. More than 40 employers were on site looking for to fill positions in the Crawford County area.